The new cinema complex at Blacktown in Sydney's west is the second designed by Crowd Productions and Studio dp for the Hoyts corporation. In approaching each cinema complex we have sought to draw on elements from the local cultural context to evolve unique destinations that still form part of a recognisable commercial chain. Blacktown has a unique cultural environment and energy. 70% of the population is under 45 years of age making it the youngest demographic zone in Australia. It's population has the highest uptake of domestic digital technology and Mercedes Benz cars in the country. It is also the heartland of Australian Hip Hop culture and the location of Australia's biggest home grown theme park.To celebrate this rich fusion of contextual elements, that help define the surrounding community, we sought to make this cinema complex a laboratory for exploring digital technologies in public environments. 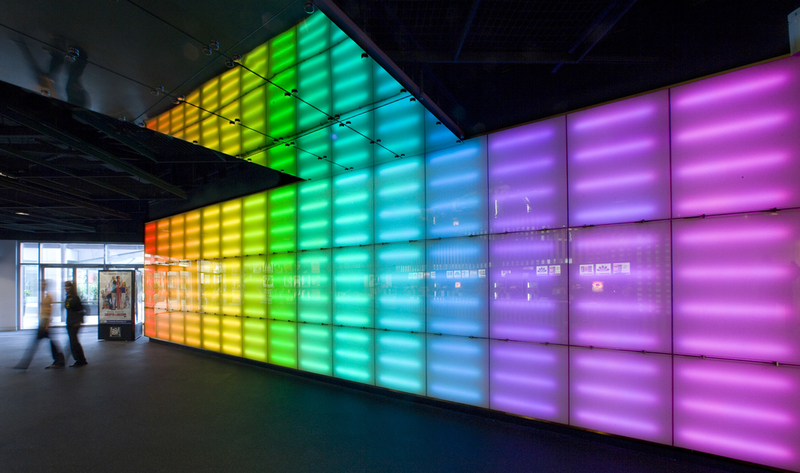 We wanted to celebrate the possibilities of programmable space, develop an approach path suitable for the biggest multiplex cinema screen Australia and present a colourful and robust public space. The core of the interior is the Generator, a programmable digital light wall that bounds the foyer and is reflected off the half silvered mirror faade of the candy bar back out through the glass shop front into the public mall beyond. The generator acts both as an attractor, activating the foyer space for passers by and enabling the interior ambience to be tuned to changes in the daily or weekly cycle of use and to the ever-changing cinema menu. The generator can be upgraded like computer hardware with more sophisticated software to change its performance. It can, in the future, be interfaced to mobile phone SMS messages allowing patrons to program changes to the ambience. 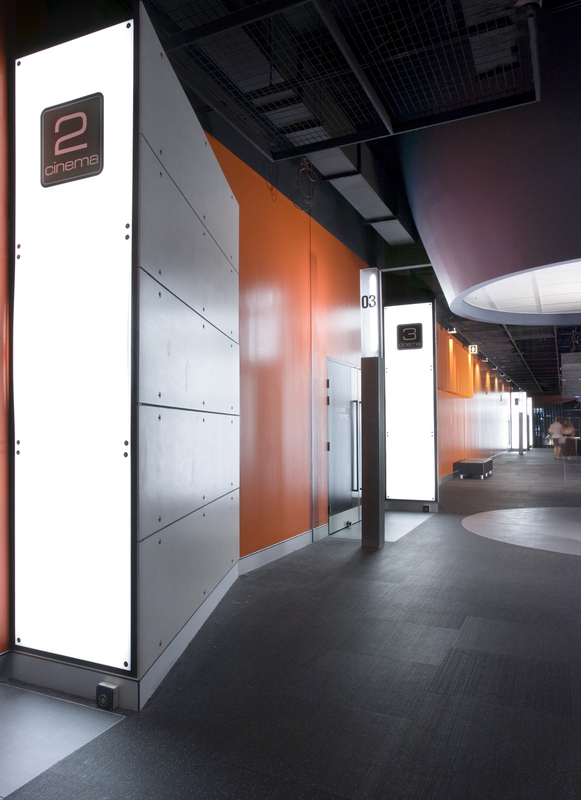 Media bollards in the foyer play trailers on demand and advertise the cinema menu.The long central corridor running through the centre of the complex has been broken up by saw-tooth mirror ceiling arrays and LED floor stripes that distort the natural perspective of space and distance. The lightbox cinema entries bulge from the corridor wall like the flared guards of a hotrod. 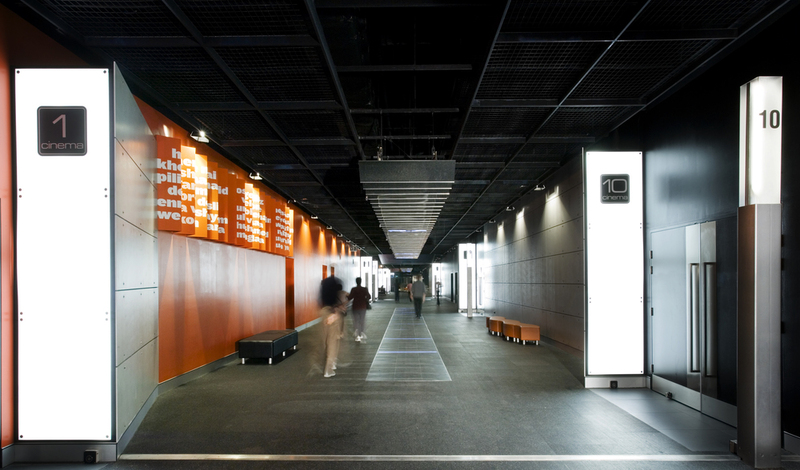 The black rubber floor, stainless steel leaning rails and cement sheet wall panels lining the main corridor are offset by a 100 metre long bright orange wall. The main corridor terminates in a second public and social space at the entry to the 600 seater cinema at the heart of the complex. This lounge features a series of translucent boundary partitions and an array of plasma screens playing trailers. The lounge has been designed to be retrofitted with interactive vending machine merchandising technology and mobile food and beverage kiosks. This space anticipates the possibility of staging cinema and media events showcasing local products.